There is much hand wringing in the startup ecosystem about various forms of signaling between the seed and A rounds. Conventional wisdom, and advice, abounds: entrepreneurs should never include a venture firm in their seed round because it’ll scare other VCs off from pursuing the A. After all, the “insider” VC has more information and influence than potential outside investors, so why would a new firm enter a losing fight? Conversely, VCs should not waste time meeting with startups seeded by other VCs: “everyone knows” that if the company is good, the inside-the-seed VC will preempt it. And if the company is not good, well the other VC knows that better too, and how embarrassing would it be to invest in someone else’s known mistake and watch them snigger about it over drinks. The game has another level: because good entrepreneurs “know” this and thus don’t take money from VCs in their seed rounds, VCs should not pursue seed rounds at all as they would be fishing in an adversely selected pool. And that means having a VC in your seed round is a sign of weakness. Analyzing the game is intellectually interesting and it sure comes off like sound logic. But is any of it actually true? Does the market in fact value this 21st century version of court intrigue, or do entrepreneurs and investors just try to find the best match? My partner Jared Sleeper and I decided to look at the facts. We gathered our best approximation of the recent, higher quality A round data set and analyzed the seed history. We needed to somehow define “recent” so we focused on A rounds that Crunchbase says were completed in 2018, knowing that we’ll miss some companies that have managed to successfully remain in stealth mode. To take a stab at “higher quality” we narrowed in on A round investments by the top 30 firms, which we somewhat arbitrarily selected as the 30 firms most important to us at Matrix. There are many other ways to set these definitions but we picked ours and didn’t mess with them; we do not believe that tweaking definitions would change the message. And it turns out the current market couldn’t care less about all the purported signals and counter signals. The attached charts show the data, for all of the US, for the Bay Area, and for Boston/New York. Blue: Never raised a seed — i.e., went straight to an A round. Yellow: Raised a seed that the top 30 venture firms did not participate in. Could have been only angels and seed funds or it could have included a venture fund that didn’t fit in our top 30 list. Importantly, we have no information on scouts, individual GP checks, or seed funds closely linked to the top 30 VCs, so this pie slice likely represents an upper bound. 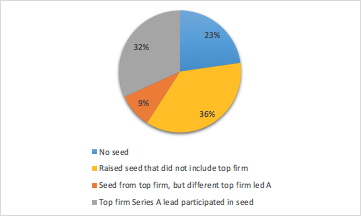 Orange: Raised a seed that one of the top 30 firms did participate in, but that fund did not lead the A.
Grey: Raised a seed that one of the top 30 firms did participate in, and that firm led the A. Remember that every one of the 70 companies in the dataset ultimately raised an A round from a top 30 firm. If VCs did in fact shy away from pursuing an investment in a company that had raised a seed from another strong investor, the orange slice would not exist. Well that slice represents roughly a fifth of all A rounds in the set, a whopping one third in the Bay Area, and 9% Boston/NY. What’s really striking is that the orange slice is larger than the grey slice everywhere except Boston/NY. 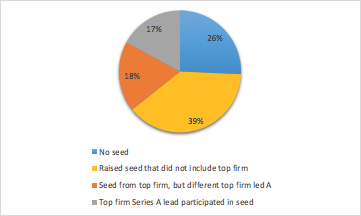 “High quality” companies that had included a top VC in their seed round are in fact more likely to have their A round led by another top tier VC that did not participate in the seed — twice as likely in the highly competitive Bay Area. Smart entrepreneurs are also clearly not listening to the advice to exclude top firms from their seed rounds. If they did, there would be few top firms included in seed rounds of these higher quality companies. Yet over a third of these companies, or roughly half of the ones that raised a seed at all, included a top VC in their seed (represented by the orange and grey slices combined). In the Bay Area the data is even more convincing: about half of the “higher quality” companies, or 62% of the ones that raised a seed round at all, included a top firm in their round. Furthermore, the numbers are surely higher because of scout funds and closely related seed funds. Finally, “marrying your high school sweetheart”, represented by the grey slice, is rare. 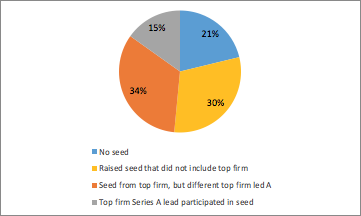 Fewer than 1 in 5 startups meet their dream investor at the seed stage. Everyone else is still looking and considering at the A round. So what’s the takeaway? While pundits pitch various complicated signaling theories, we are all busy operating in a high velocity, competitive market that is full of smart people who have no time for palace intrigue. Good entrepreneurs are seeking out the best investing partners they can at every stage, and are not exhibiting undue loyalty — sticking with them as A round leads if they are happy with the relationship and like the offered terms, and selecting another lead otherwise. As they should. And good investors are trying to find the best companies and entrepreneurs to get in business with based on the evidence of the business as opposed to making decisions based on perceived signaling factors. As they should. The market is more efficient than many would have us believe. Note: a few readers have pointed out that our analysis only looked at signaling effect in the set of companies that raised an A round from a top firm, and did not consider the ones that failed to do so or chose to go a different route. We did this largely to limit scope, but also because for that latter group we couldn’t think of a good way to separate signaling from company performance from a preference for a non-top firm. Having said that, our data do indicate that A round leads don’t pay a lot of attention to the seed leads, which would at least directionally suggest that adverse signaling is unlikely.